Fans of Vince Flynn’s Mitch Rapp series of thrillers were greatly saddened by his premature passing in 2013. Fortunately for them, the franchise has been placed in the very capable hands of Kyle Mills, who delivers a page-turning adventure in his fourth sequel to this realistic and absorbing series. 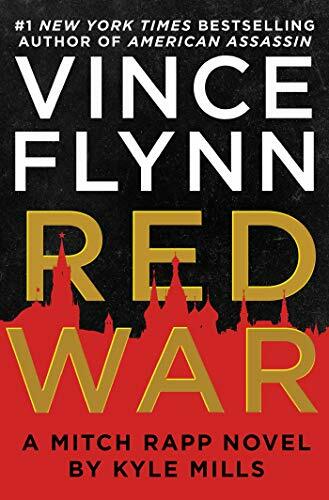 Red War continues the storyline that has been slowly unfolding over the last three books as Mills works in new characters and takes familiar characters in unexpected directions. Mitch and his team of unlikely heroes collected over Mills’ tenure confront their greatest challenge yet—a potential nuclear war between a resurgent Russia and the NATO alliance. The gradual shift within this series from its origin of Mitch Rapp as the ultimate terrorist hunter to Mitch Rapp facing a reconstituted Russian threat to the U.S. and its European allies certainly reflects the current geopolitical environment as well as the mindset of many defense and intelligence professionals. Mills has done an excellent job in making this shift while keeping true to the atmosphere of this series. The plot is both highly plausible and scarily realistic, and it moves along at a vigorous pace, with new secondary characters and various subplots flowing seamlessly into the final conflict between Mitch and his nemesis. Like previous novels, the plot draws the reader in quickly and packs a lot of action into 400 pages. Not surprisingly, Mitch’s greatest adversary turned erstwhile ally, Grisha Azarov, and his long-time backup man Scott Coleman are highlighted in this book, as well as his new love interest, Claudia Gould. The relationship between these characters and Mitch highlight his conflicted anti-hero personality and emotional distance, all of which are exceedingly well done by Mills. There are no completely good guys in this book as all the characters show their humanity as they come to terms with the personal costs of conducting dangerous covert missions, sometimes for their country, and sometimes for their own personal ends. The poignant side of the characters has also been drawn out, especially the hardened Mitch Rapp, who has now found someone that can penetrate his crusty personal shell developed over this entire series of books since the death of his wife early in the series. Like all good novels, the characters drive the story and Mitch Rapp continues to be a mainstay of the modern techno-thriller. The need for a great villain is also a must for a good thriller and Russian President Krupin, a staple from the earlier sequel novels, makes another appearance in this book, now aided by a capable and sinister Lieutenant in the form of Russian Marshal Andrei Sokolov. Krupin’s drive to revive Russia as a world power is driven by his own demons and ambitions and Mills does a chilling job of showing how an absolute dictator with nuclear weapons could shake the foundation of the world order. Together the two men craft a perfectly planned scheme to attack and divide NATO by invading the Baltic countries of Latvia, Estonia, and Lithuania. The fictional response of the Baltics to a Russian attack may surprise some readers but Mills has clearly done his homework to craft a realistic scenario for how a Russian attack might play out and how NATO might react. The final confrontation is as satisfying as one would expect from a Mitch Rapp novel, yet Mills clearly leaves from room for the next book, as there are always threats to American interests that only Mitch Rapp can confront. The book is a brisk and engaging addition to Vince Flynn’s legacy of great thrillers. Jerry Lenaburg is a staff reviewer at New York Journal of Books.